Aim: To compare the effectiveness of radiological skeletal survey and bone scintigraphy for the detection of bony injuries in cases of suspected child abuse. Methods: All cases with a discharge diagnosis of child abuse that presented to the Royal Children’s Hospital between 1989 and 1998 were retrieved, and those children that had undergone both skeletal survey and bone scintigraphy (radioisotope bone scan) within a 48 hour period were included in this study. Both examinations followed rigid departmental protocols and protocols remained identical throughout the timeframe of the study. The reports of the skeletal surveys and bone scans were retrospectively reviewed by a paediatric radiology fellow and consultant paediatric radiologist. Results: The total number of bony injuries identified was 124 in 30 children. Of these, 64 were identified on bone scan and 77 on skeletal survey. Rib fractures represented 60/124 (48%) of the bony injuries and were present in 16/30 children (53%), of which 62.5% had multiple rib fractures. Excluding rib fractures, there were 64 (52%) bony injuries, of which 33% were seen on both imaging modalities, 44% were seen on skeletal survey only, and 25% were seen on bone scans alone. Metaphyseal lesions typical of child abuse were present in 20 cases (31%) on skeletal survey; only 35% of these were identified on bone scan. 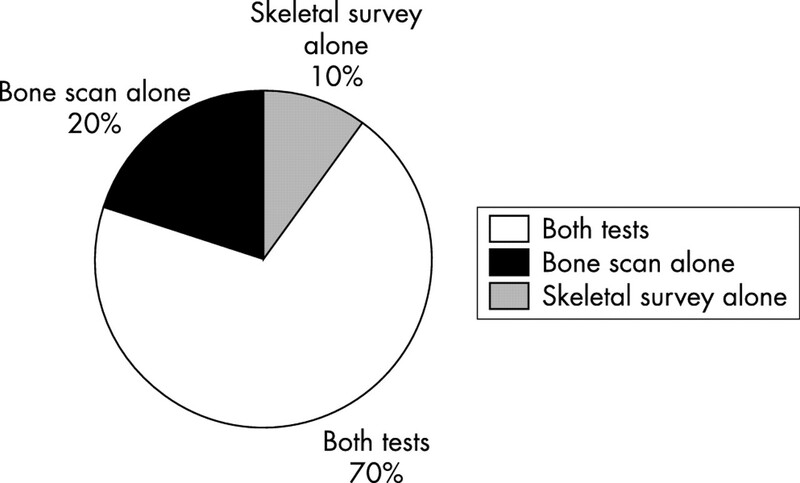 Six children (20%) had normal skeletal surveys, with abnormalities shown on bone scan. There were three children (10%) with normal bone scans who were shown to have injuries radiographically. Conclusions: Skeletal survey and bone scintigraphy are complementary studies in the evaluation of non-accidental injury, and should both be performed in cases of suspected child abuse. In the recording and documentation of suspected child abuse, identification of skeletal injuries by the radiologist plays a vital role. Evidence of unexplained fractures, especially if multiple or of differing ages, is highly suspicious of inflicted injury, and certain types of fractures are regarded as being virtually pathognomonic of child abuse. Both skeletal survey and bone scintigraphy are utilised in imaging of suspected child abuse, but there are few studies comparing the two. In this study, we use the Royal Children’s Hospital experience to assess the yield of each of these two imaging modalities in identifying skeletal injuries in cases of suspected child abuse. The radiology records of 124 children with the discharge diagnosis of non-accidental injury at the Royal Children’s Hospital during the years 1989–98 were reviewed. Those children who had undergone both a skeletal survey and bone scintigram within 48 hours of each other were included in our study; 32 children fulfilled these criteria. The imaging protocols were identical for each child with strict adherence to departmental guidelines (see appendix). A paediatric radiology fellow and consultant retrospectively reviewed the reports of the skeletal surveys and bone scans. The sites, types, and number of bony injuries were recorded. Soft tissue uptake on bone scans was not recorded. Thirty two children fulfilled the criteria for inclusion into this study. Twenty four (75%) were under 12 months old and 30/32 (94%) were less than 3 years of age. One child underwent two sets of investigations: one in 1995, which revealed no bone injury on either modality; and another in 1997, which showed a solitary ulnar fracture on both modalities. Table 1 summarises the results. The total number of injuries identified was 124. Of these, 64 (52%) were identified on bone scan and 77 (62%) on skeletal survey. In two cases, both the skeletal survey and bone scan were normal. Nineteen children (59.4%) had multiple injuries. Rib fractures were the commonest injury. These were often multiple, and were present in 16 (62.5%) of the 30 children with injuries. Six cases (37.5%) had solitary rib fractures, 50% of which were shown using both modalities and 50% of which were seen on bone scan alone. Ten children (62.5%) had multiple rib fractures. Excluding rib fractures, there were 64 bony injuries, representing 51.6% of total injuries, of which 21 (32.8%) were seen on both imaging modalities. Of the remaining 43 injuries (34.8%), skeletal survey identified 28 of 43 (65%), which were occult on scintigraphy; and scintigraphy showed 15 of 43 injuries (34.9%) that were radiologically occult. There were four pelvic injuries (3.2%) and two foot injuries (1.6%) seen on bone scan, none of which was detected on skeletal survey. These areas showed increased radioisotope uptake without definite evidence of fractures. There were no hand injuries in any of the 30 patients with bony abnormalities. There were nine skull injuries (7.3% of total). Eight (89%) were seen on skeletal survey and only three (33%) on bone scan. Scintigraphy did not identify four skull fractures and two cases of sutural diastasis. In one case, the bone scan was normal, yet the skeletal survey showed multiple injuries involving both femoral metaphyses (classic metaphyseal lesions) and the left tibial shaft. There were 20 classic metaphyseal lesions (CML) identified, of which only seven of 20 (35%) showed increased uptake on scintigraphy. The commonest site of CML was in the distal femur (50%), with six CMLs (30%) of the tibia in four children. CML were less common in the upper limbs and femur with one case (5%) each involving humerus, radius, ulna, and fibula. Importantly, in six (20%) children with normal skeletal surveys, abnormalities were shown on bone scan. In these cases, 10 injuries were shown: three pelvic, two radius, two ribs, two ulna, and one foot. There were three children (10%) with normal bone scans who were shown to have five injuries radiographically. Of these five injuries, one was a skull fracture and four were CML (fig 1, table 1). Percentage of bony injuries detected. In one case, a 4 month old boy with a suspicious clinical history and no documented trauma was admitted to the hospital because of irritability. Skeletal survey revealed old right rib fractures and a left pleural effusion. Bone scan performed one day later was normal. A repeat chest x ray performed two weeks later again showed right rib fractures, and also showed multiple left rib fractures. Repeat bone scan showed bilateral corresponding rib abnormalities. During the two week interval between examinations, the boy had been in contact with the suspected abuser. The demonstration of new bone scan abnormalities confirmed ongoing abuse and skeletal injury on a background of presumed old injury dating back to shortly after birth. Although skeletal injuries rarely pose a threat to the life of an abused child, they are often the strongest radiologic indicators of abuse.1 It is well recognised that certain patterns of injury are sufficiently characteristic to permit a firm diagnosis of inflicted injury in the absence of clinical information.2 Most infants who die from inflicted injury have fractures at multiple sites, and aggressive radiological efforts to identify these injuries in living infants are justified to make the diagnosis and help prevent further abuse.3 In our study, we recognise the complementary nature of the skeletal survey and the scintigraphic bone scan. Utilisation of both imaging modalities allows increased identification and documentation of skeletal injuries, as evidenced in our study: 20% of children with injuries were identified on bone scan only. The additional information obtained may be invaluable in the investigation and prosecution of child abuse. Bone scan is said to give positive results within hours of an injury, and scintigraphic features have a characteristic time course of appearance.8 Bone scan is useful in detecting fractures that are difficult to recognise on radiographs, for example, feet, hands.8 In our study, two foot injuries were detected on scintigraphy although they were radiographically occult. None of our patients had hand injuries on either modality. Fractures occurring near growth plates may be difficult to detect because of normally increased uptake activity of the growth plate.8 In 1957, Caffey described the classic metaphyseal lesion, which is now considered to be characteristic if not pathognomonic of non-accidental injury.2,9 These injuries are important to detect and may be missed on bone scintigraphy. In our study, 20 classic metaphyseal lesions (CML) were identified, of which only seven (35%) showed increased uptake on bone scan. No single imaging technique is ideal, with neither providing all the answers needed in evaluation of the possibly abused child. We recognise that neither modality is foolproof, and in the absence of a “gold standard” investigation, both bone scans and skeletal surveys have useful roles.5 It is important that studies be read “in context”. A good example is that of the 4 month old child who had multiple rib fractures on skeletal survey and no isotope uptake on initial bone scan. A second bone scan performed two weeks later showed multiple fractures. It transpired that the child had been in the care of the abuser during those two weeks and that new fractures had occurred on the background of “old”, metabolically inactive fractures. The cost of plain radiography is significantly lower than that for bone scintigraphy. In Australia, the cost of a bone scan is six times more than that of skeletal survey.11 Kleinman reports the cost of radioisotope bone scan to be 70–300% higher than that of skeletal survey.2 Although this is obviously important in developed countries, the cost of both these investigations in developing countries may preclude the use of scintigraphy altogether. Radiology is extremely important for documentation and dating of skeletal injuries, and in defining the mechanisms of injury in abused children. Bone scans can be used for enhanced recognition of trauma so that legal and social aspects of child abuse can be linked to the number, extent, and severity of lesions identified. Bone scintigraphy is a complementary modality to radiological evaluation of the abused child, allowing otherwise undetected fractures to be identified. It is important to note that in six children with normal skeletal surveys, abnormalities were shown on bone scan. Conversely, there were three children with normal bone scans who were shown to have injuries radiographically. These nine children constitute 30% of the group of children with abnormality seen on at least one study. As most centres utilise the skeletal survey as the first line investigation, this implies that 20% of children in this series would not have had confirmation of bony injury had the bone scan not been performed. The investigation of potential child abuse should include adequate skeletal survey and bone scintigraphy. Both of these investigations should be channelled to those institutions with the equipment and expertise to perform and interpret them adequately. This would usually, but not necessarily, be a tertiary referral centre. It might be impractical to restrict investigation to tertiary centres alone, as this may reduce the incidence of investigation. It is important that both tests are adequately performed. In certain circumstances images could be referred to specialised centres for review; however, this is not recommended as ideal. This study shows the complementary nature of the skeletal survey and the scintigraphic bone scan. Utilisation of both imaging modalities allows increased identification and documentation of skeletal injuries. This is invaluable in the investigation and prosecution of child abuse. We recommend that both tests be performed adequately, as findings have a direct bearing on the outcome for the individual child. The skeletal survey protocol (table A1) utilises high detail intensifying screens with double emulsion film. Tightly collimated views of the central and axial skeleton are obtained. The study is reviewed by the radiologist and when deemed necessary, additional views are added. The bone scintigram protocol (table A2) utilises a current generation gamma camera and includes blood pool and delayed phase images. American Academy of Pediatrics. Diagnostic imaging of child abuse. Pediatrics2000;105:1345–8. Kleinman PK. Skeletal Imaging Strategies. In: Corra E, ed. Diagnostic imaging of child abuse, 2nd edn. Missouri: Mosby, 1998:237–41. Ablin DS, Greenspan A, Reinhart MA. Pelvic injuries in child abuse. Pediatr Radiol1992;22:454–7. Ellerstein NS, Norris KJ. Value of radiologic skeletal survey in assessment of abused children. Pediatrics1984;74:1075–8. Conway JJ, Collins M, Tanz RR, et al. The role of bone scintigraphy in detecting child abuse. Semin Nucl Med1993;XXIII:321–33. Belfer RA, Klein BL, Orr L. Use of the skeletal survey in the evaluation of child maltreatment. Am J Emerg Med2001;19:122–4. Jaudes PK. Comparison of radiography and radionuclide bone scanning in the detection of child abuse. Pediatrics1984;73:166–8. Caffey J. Some traumatic lesions in growing bones other than fractures and dislocations: clinical and radiological features. BJR1957;30:225–38. Kleinman PK, Marks SC, Blackbourne BD. The metaphyseal lesion in abused infants: a radiologic-histopathologic study. AJR1986;146:895–905. Medicare. Benefits schedule book. Commonwealth Department of Health and Aged Care, Commonwealth of Australia, 2001:426, 434. The role of scintigraphy in the diagnosis of child abuse has received little attention in the recent radiological literature. This well written paper is a useful reminder of the potential role of scintigraphy. Its use is variable and is probably more widespread in Australia and the USA than in the UK. The radiographic skeletal survey remains the cornerstone of investigation in clinical practice in Britain, scintigraphy being used in limited circumstances. In my personal practice it is used mainly to resolve doubts about the nature of a suspected lesion in a rib or shaft of a long bone. The rationale for its use is a reported increased sensitivity in the detection of skeletal injury compared with radiographic skeletal surveys.1–3 The specificity of scintigraphy is less and all authors agree that radiographic skeletal survey and scintigraphy are complementary, reiterated in this current paper. There are several papers in the literature detailing injuries detected by scintigraphy but not visible on radiographs. These include soft tissue injuries1 and bony injury in complex areas such as the pelvis.4 On the other hand, skull fractures and metaphyseal fractures, both of which are often critical in making the diagnosis of abuse, are often not visible on scintigraphy and cause a false negative scan. A positive scan depends on an intact blood supply to the area of interest plus sufficient osteoblastic activity to distinguish pathologically increased uptake from surrounding physiological uptake. Skull fractures occur in membranous bone, and repair without much osteoblastic activity. Metaphyseal fractures occur very close to the growth plate, the site of maximal activity in the immature skeleton. Many metaphyseal fractures cause minimal bone reaction and this cannot be distinguished from normal growth plate activity. Pathological increased uptake may also occur with osteomyelitis, which in infants is located in bone metaphyses. Multiple pathological areas of increased activity should not cause confusion as these indicate either fractures or metastatic disease, and in a young infant this latter is usually obvious but clinical correlation must occur. All lesions, and in particular an isolated lesion, must be interpreted cautiously and carefully correlated with the clinical presentation, haematology, and radiographs. In addition to the well known and established pitfalls on scintigraphy, there are practical problems to be addressed in achieving a high quality diagnostic image. A venepuncture is required—easy in a children’s hospital, but infant venepuncture in a department mainly dealing with adults may require more organisation and prior intravenous cannulation. To achieve high quality images—necessary for diagnosis—the infant or toddler must be still. This requires sedation or, increasingly in the UK, general anaesthesia. Proper monitoring is required. For pelvic and upper femoral views, the bladder should be empty and any contaminated nappy removed so that counts are acquired from the skeleton. If not, pathology here may be missed. In rare circumstances, catheter insertion may be needed. The lower limbs must be straight and should be imaged separately from the torso. The child may be in a gallows traction for treatment of a fractured femur. Pain relief may be needed while moving the child to the nuclear medicine department. None of these problems occur for the radiographic survey. If necessary, films can be done portably, though not optimally. The underlying principle of all imaging in children—do it once properly—is important. Nuclear medicine radiation doses are expressed as EDE—effective dose equivalent. The dose is scaled to a formula to recognise different body mass. The biodistribution of radiopharmaceuticals in children is different and may give higher local doses than in adults, but the overall EDE is the same. The effective radiation dose for the nuclear medicine scintigram is 3 mSv, based on an adult dose of 600 MBq. The dose for radiographic survey will depend on the number of exposures and the technique. A dose estimate based on 16 films using computed radiography is 0.16 mSv (personal communication). So, do we need both techniques? In the series reported from Melbourne, 20% of children had abnormalities detected on scintigraphy with normal radiographs. Most of these lesions were in the pelvis, radius, and feet, areas that would not be re-x rayed if the policy of repeating the chest x ray and radiographs of knees and ankles 10 days to two weeks after the initial survey were followed.5 This means that the diagnosis of abuse might not have been made in these children if evidence of bone injury was critical to the diagnosis. Does the finding of additional lesions in a child with already diagnosed typical lesions on x ray and clinical findings contribute to the diagnosis? In most instances, probably not. There is no doubt that the two techniques are complementary, and together will diagnose more lesions than either alone. I hope no one would argue that a bone scan alone is an adequate means of excluding a skeletal injury in suspected non-accidental injury. Is it justified to perform both on every child? In my view, no. I believe that the policy in the UK should be that if the radiographic survey is positive, that is sufficient evidence. If it is negative, scintigraphy is warranted provided that the clinical assessment justifies it. It must be performed with a meticulous technique and interpreted with the radiographs. Scintigraphic positive lesions, if negative on the routine survey, should have localised radiographic views performed, but even then some bony lesions may not be radiographically visible and a positive scintigraphic lesion should be regarded as an injury. Soft tissue lesions, with the exception of calcified haematoma, are seldom radiographically visible. The presence of these lesions is significant as they reflect significant focal soft tissue injury, which in the context of abuse is caused by tissue bruising. These lesions are not found on routine scintigraphy performed for other purposes, for example, infection or metastatic disease, and are therefore an index of significant trauma. Determining whether periosteal new bone is pathological or physiological can sometimes be a problem. Physiological new bone does not have increased uptake on scintigraphy. Pathological new bone will show diffuse uptake in the affected limb compared with the contralateral, provided both are not affected. In these circumstances, the increased uptake may be symmetrical and therefore hard to detect. The detection of soft tissue injury and lesions that are radiographically negative, but which would alter management, are the two main advantages of scintigraphy. Conway JJ, Collins M, Tanz RR, et al. The role of bone scintigraphy in detecting child abuse. Semin Nucl Med1993;23:321–33. Sty JR, Starshak RJ. The role of bone scintigraphy in the evaluation of the suspected abused child. Radiology1983;146:369–75. Kleinman PK, Nimkin K, Spevak MR, et al. Follow-up skeletal surveys in suspected child abuse. AJR1996;167:893–6.